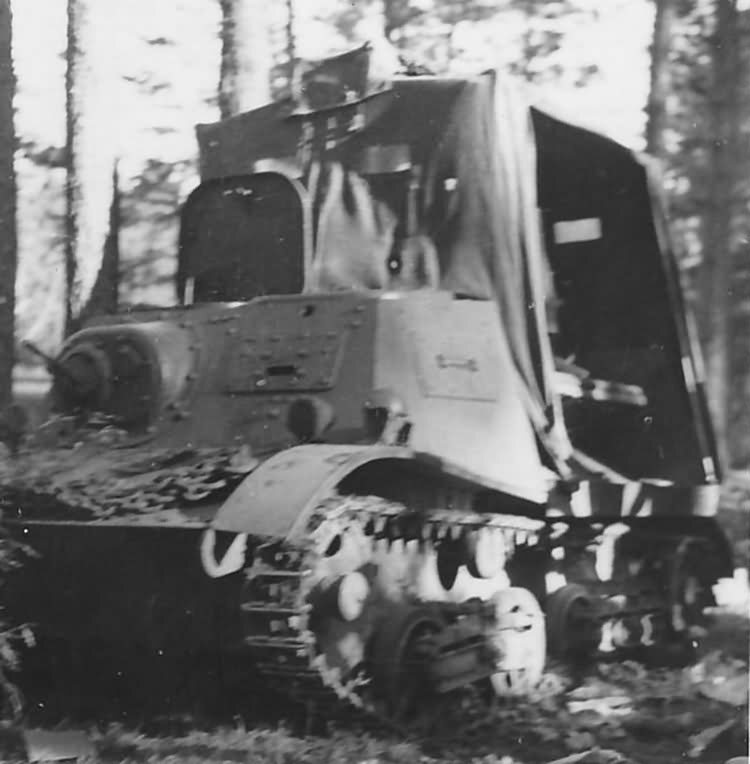 This vehicle was a small armored tractor which was designed for towing artillery pieces. They played their part in motorization of artillery units in the late 1930s, and saw extensive action in the Winter War and first half of WWII on the Eastern Front. 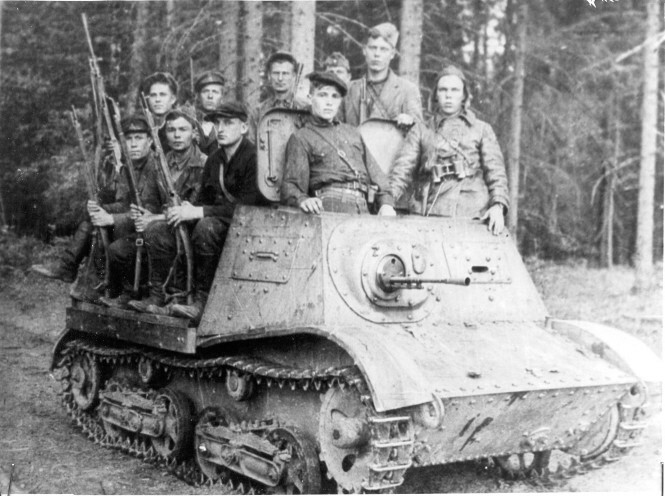 This vehicle would even be modified into the ZiS-30 tank hunter in 1941, but was perhaps better known for its unintended multi-role use as an armored personnel carrier, ammunition carrier, gun carrier, as well as a tankette as a result of the lack of tanks that the Red Army faced during the early stages of WWII. A group of partisans use a Komsomolets as an APC. Throughout the 1930s, there was a significant increase in the size and power of AT guns, which meant that maneuverability of these guns, and their crews, was becoming ever more limited. The Soviets felt the need for increasingly mobile anti-tank units, but had no effective means of achieving this. The Komsomolets tractor was intended to be the design that would give the Red Army motorized artillery troops, and therefore the required flexibility of such a unit. 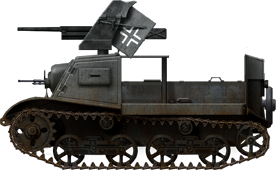 Specifications required a light and mobile vehicle that could change positions quickly, especially when close to enemy units, roughly 500-1000 m away, but it also had to at least match the speed of enemy armored units. However, a more important specification demand was that it had to be cheap and easy to mass produce, as the Red Army was in dire need of rapid mechanization. 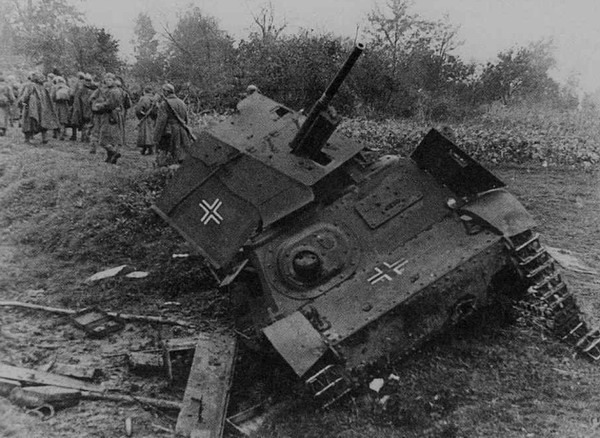 In order to do this, designers decided that they should use many features from tankettes and light tanks, including a chassis, gearbox, and engine. A technical drawing of the Komsomolets. This development became the “Pioneer” tractor from Plant Nr. 37 in Moscow, but only 50 were produced and participated at the November 7th parade, 1937, at Red Square. They were not accepted into service as a result of poor stability, traction, and cornering abilities. Although the Pioneer could reach speeds of 50 km/h (30 mph), it still had the aforementioned problems, and the driver was not thought to be well protected enough. Despite NATI ordering two modifications to resolve these problems, the B1, and B2, they turned out to be even worse designs overall, and were never put into mass production. At the end of 1936, under the leadership of the famous designer, N.A. Astrov, the plant began work on the Komsomolets tractor, which was primarily designed to tow the lighter artillery pieces of the Red Army. – namely the 45 mm (1.77 in) 53-K, and 76 mm (3 in) F-22 guns, as well as the 120mm M1938 mortar. 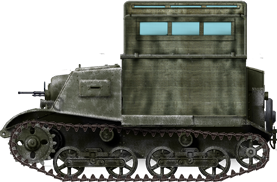 The Komsomolets was a much more spacious vehicle than its predecessor, and had 7-10 mm (0.28-0.39 in) riveted plates of armor. This protected both the commander and driver from small arms fire, as well as small shrapnel fragments. The commander, who was sat on the right, was given a DT machine gun in a ball-mount, which had a mantlet, common to most Soviet AFVs, protecting it. The engine, the GAZ-M, was the similar to the one on the Pioneer, which was located just behind the flywheel. It was closed off in an armored box for extra protection, but with hinged lids for access. The rear deck of the vehicle was open topped, but could feature a tarpaulin during poor weather, which made the vehicle 2.23 m high. There were seats at the back, sometimes cushioned, for up to six passengers or some ammunition to be carried. Two limbers could be hauled in tow if more ammunition needed to be carried. Ingeniously, the tractor also had dual controls for both the driver and commander. If the driver were to be killed or injured, the commander could take over as the driver without having to swap seats, which was intended to increase the survivability rate of the artillery unit. Tests on this vehicle began in August, 1937, and finished in November. It was found that a fully loaded vehicle could reach speeds of 15-20 km/h (9-12 mph), which was considered quite fast for this type of tractor. However, the engine was not practically suited for such a heavy load, as it was a mere car engine, which would lead to various mechanical failures such as leakages, the connection rod being worn out very quickly and the head gasket breaking. A more powerful engine of the same size could not be found, so it was concluded that they had no choice but to use the under-powered GAZ engine. The Komsomolets was designed in Plant Nr. 37, in Moscow, and they were serially manufactured at STZ, GAZ, and Plant Nr. 37 from 1937-1941. There were plans to make unarmored versions of the vehicle to speed up production, and they featured slightly different engines, usually around 76 hp GAZ engines, but these were not liked by the military, and all of these projects were dropped. 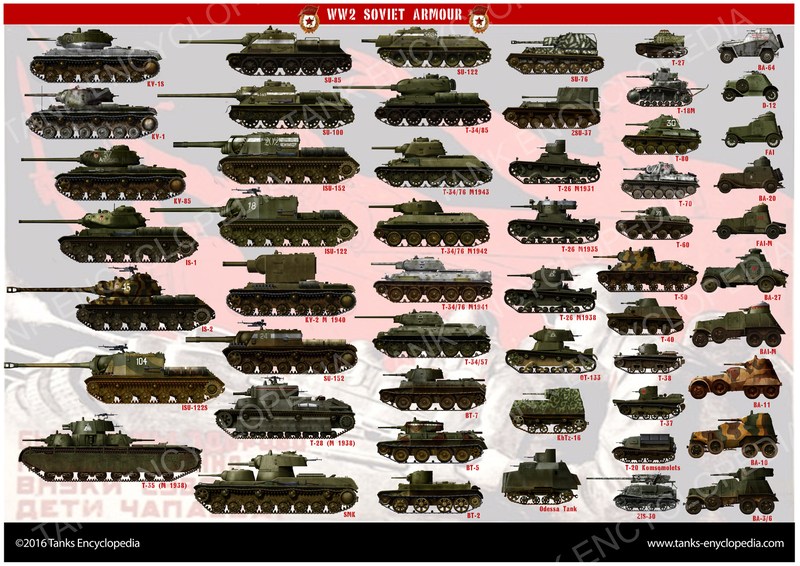 Production ended in 1941 because of a need to increase production of light tanks and the T-34. It is unclear how many Komsomolets tractors were produced, with some sources suggesting the figure to be around 4400, and other as high as 7780 from several producers of various modifications. Modifications were usually minor, and only concerned things such as seat arrangement, suspension parts, cooling systems, and other small features. 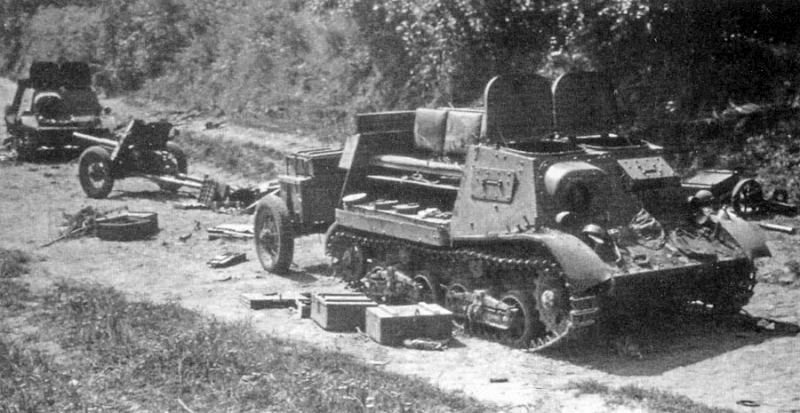 Romania – designated the vehicle “Ford rusesc de captura“, they were used to tow the 5 cm (1.97 in) Pak 38 gun. Germany – designated the vehicle “Leichter Artillerieschlepper STZ 3 630(r)“, they were used to tow various field guns. 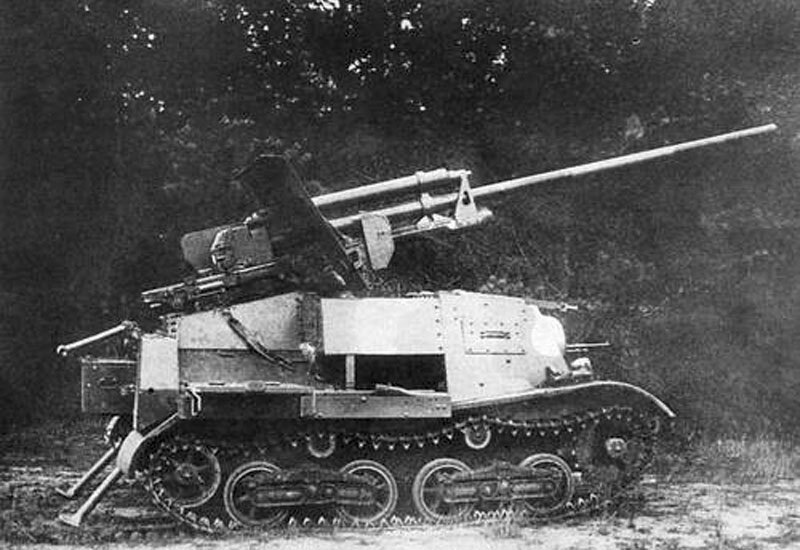 ZiS-30 – A Soviet improvised design in 1941 which adapted the vehicle to mount a long 57mm gun. The tractor was now used as a tank hunter at the Battle of Moscow, with around 100 made. 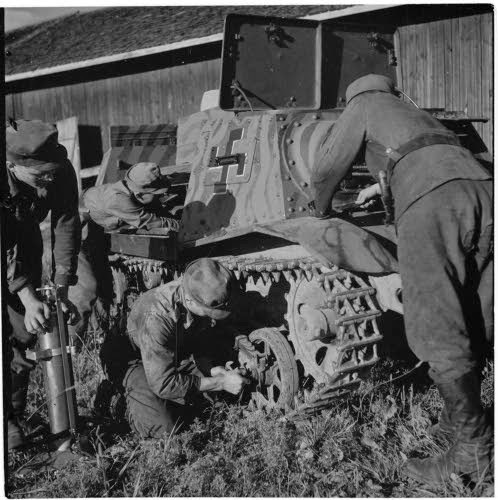 Germany modified a few captured Komsomolets to carry the 3.7cm Pak 35/36 gun, similar in design to the ZiS-30. The tractor was generally well met by its users, and played a huge rule in motorization of the Red Army. 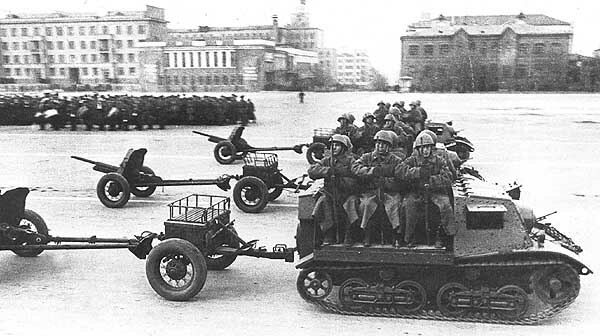 Each Rifle Division had at least 60 Komsomolets tractors, and sometimes replaced the T-27 tankette. Sometimes these tractors served as infantry transport vehicle, as Soviet industry could not provide sufficient transport for infantry. Some Komsomolets on parade with a second limber for ammunition. One of the major complaints concerned the engine cooling system. The engine was air-cooled, but in dry conditions, dust which was chucked up from the tracks, could clog up the air intake, which would damage the engine. In later models, the air intake was moved closer to the rear passenger seats. The tractor first saw action in 1938 against the Japanese at Lake Khasan, and in 1939 at Khalkhin Gol. It also served in the Winter War and WWII, and remained in service until 1945. In WWII it was used as a tankette, as a result of the lack of tanks in the very early stages of the war. However, it was not effective, as it was not designed for this role. By September 1st, 1942, only an estimated 1662 Komsomolets were left in working order. They were sometimes used for guerrilla fighting, and it was the perfect vehicle for such a role, as parts were easy to come by, and it fared well on rough terrain. Komsomolets T-20 in winter camouflage, 1941-42. German 3,7 cm Pak 36/37 auf artillerie schlepper 603(r) light tank hunter conversion, 1942. A German Komsomolets with a 3.7cm Pak 35/36 mounted on the turret. A pair of abandoned Komsomolets with their loads strewn across the road. 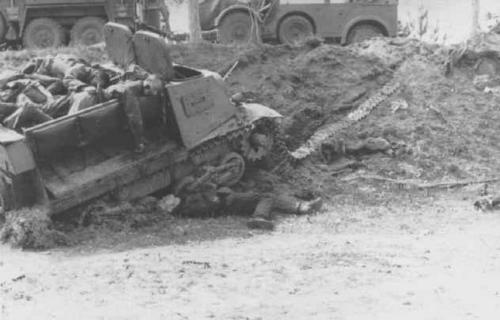 A knocked out Komsomolets used as an APC. The passengers lie dead on top and beneath it. A rare photo of a Komsomolets with a tarpaulin. I have noticed on some videos that a 4 cyl engine was fitted.Was the mention of a 3 cyl a mistake .